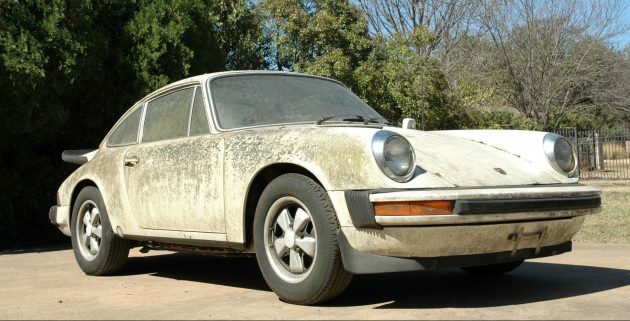 We’ve really reached the end of our ropes as to the myriad ways sellers will talk up a filthy car: enter, the “Algae Find” 1976 Porsche 911. Basically, this 911 was parked outside under carport where the drippings of a tree above and the atmosphere doing what the atmoshphre does created the effect seen here. 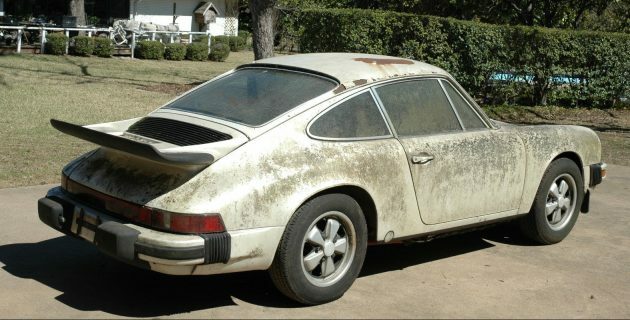 If that makes this 911 more desirable to you, check it out here on eBay where it’s already been bid up to damn near $20K. 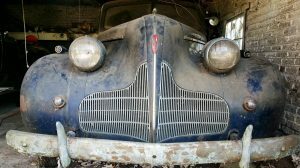 Thanks to Barn Finds reader Patrick S. for the find. The 911 supposedly resided in the care of a long-time Porsche enthusiast who parked this car when his first-generation Boxster showed up. 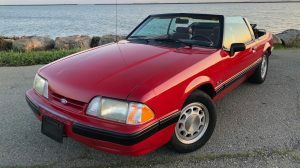 It sports a variety of nice options from the factory, including the Fuchs alloy wheels, rear pop-out windows, dealer-installed A/C, and a front chin spoiler. I’d guess the whale-tail spoiler was also an add-on at some point in time, and personally feel the car would look better without it (and the algae). 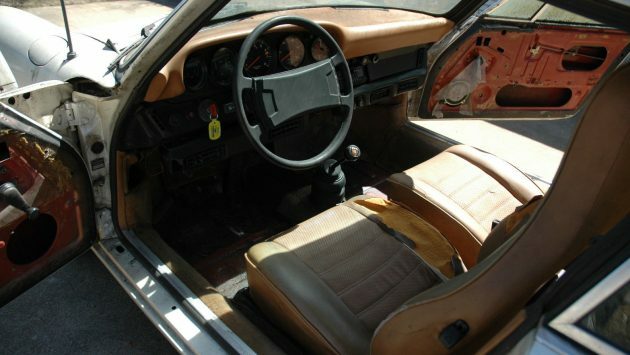 The interior is in fair condition, with what looks to be an uncracked dash and nice seats. The door panels have gone rogue but the carpeting is still in place. Beneath that carpeting are solid floors, says the seller, along with a solid chassis. There is some rust visible on the roof, possibly the spot where water dripped on the car for years, starting in 1997. The previous owner claimed to have driven the car as recently as four years ago, but the seller finds the claim doubtful. It is a non-sunroof car, which enhances the desirability ever so slightly. Supposedly, an engine rebuild was performed at just prior to 100,000 miles, which included new heads, pistons, rings, valves and upgraded Carrera timing chain tensioners. The car now shows 125,236 and the seller doesn’t mention if it runs or whether the engine turns freely. It’s interesting to see so much visible surface rust inside the engine compartment; with the car’s Dallas location, I’d want to confirm this algae isn’t residual flood debris. So, how long would it take before you’d wash all this crap off? I don’t see where the tree-sap patina adds to the value of this car. Before I’d bid on it, I’d want it washed and dried, to see if the paint might be salvageable. “Algae Find” ..AKA Neglected Find. That black stuff looks to me like “air pollution” residue- like they lived near a paper mill or factory with smokestacks. Can usually be pressure washed off. 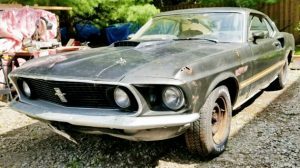 Two things that I think will hold down the selling price of this one are that, (1) being a mid-’70s “S”, it’s a 2.7 liter and thus has a magnesium case. Porsche lore is rife with horror stories of oil and exhaust leaks, problems with degraded bolts/studs and the occasional casing with cracks or stripped threads – all basically linked to the magnesium castings which didn’t play well with the higher temperatures generated by the lean U.S. emission-control systems. Not to say that these engines can’t be rebuilt and/or improved, but the owner is facing big repair bills from pricey professional shops if the work is to be done properly when the troubles pop up. (2) As far as I know, these “S” models were all K-Jetronic (CIS) cars. While CIS does limit tuning possibilities, I really don’t have that much of a problem with it – unless the car is allowed to sit for extended periods. 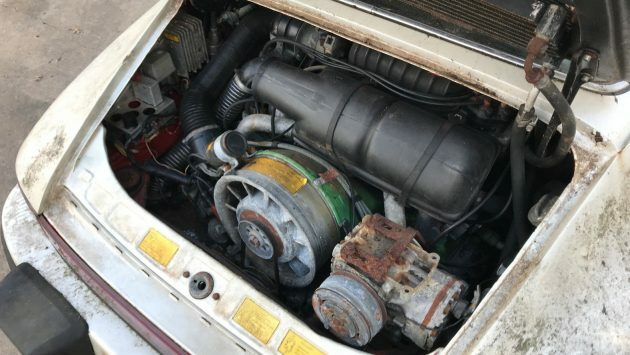 A gummy, rusty old CIS unit can cause a new owner all sorts of headaches and rebuilding one is – to me, at least – a venture better left alone… and good used units are undoubtedly as rare now as the proverbial hens’ teeth! I like the comment “Porsche Enthusiast”. Some enthusiast the owner was to let the car get in this state. A true enthusiast would have keep the car in pristine condition. People are saying anything to get a sale. I bet it took a nice bath 🛀 in floods. Seller should of clean it off to sell better price. I like the whale tail spoilers myself. Algae find–whatever he’s smoking it seems to be working-up to 19 k already. Interior doesn’t look like a flood car, but the algae does raise a red flag! Good Luck to the new owner- Caveat Emtor!! What @SquareLeft said above about the engine in these cars…. That, and it would be best to drive one first if you crave performance, which I thought was underwhelming in every one of these 2.7 liter cars I have ever driven. What everyone is trying to say is tree sap don’t add up to a p.o.s. Power washing might reveal more than they want. Playing dumb is easy. Missing door panels tell me the doors filled with water at some point. The air-cooled madness continues. I long for the day when soap, water and wax are back in fashion. Oaks and Pecan trees in particular will do this to cars parked under them for any length of time. Which hurricane RUINED this car?? Don’t be fooled, it’s a flood salvage loser. Having had a couple of early P cars…….. I couldn’t stand to let this deteriorate in this way………and I dont even like the mid seventies P cars. Has to have had a prolonged bath………not good anyway you look at it. 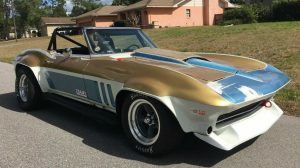 That corrosion in the engine compartment was caused by salt water air like down near the Gulf coast, the same could be said for the exterior. Reminds me of stuff I have seen around Baton Rouge then some texas dust to stick to the algee and sap build up would cause all that on the outside. Get some Dawn and let that soak in for a while and it should hose off most of it. That compressor bracket though phew.